In 2000, while submitting the project, we wrote that Ukraine was one of the new states in Central and Eastern Europe that is building a new identity and a new position in Europe. School history was made a key topic in the Ukrainian process of nation building. This choice gave history also the position of the most politicised school subject. In the project "New Times, New History" we looked into this role of history education with focus on contributing to stability and democracy in Ukraine, especially regarding the different regions and ethnic and linguistic communities within the country, but also regarding the relations with the neighbouring countries. 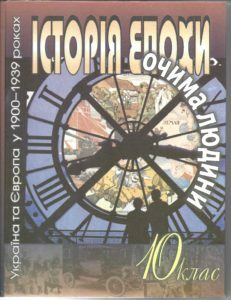 The school history textbook, History of the Epoch. The Period seen through the Eyes of an Individual. Ukraine and Europe 1900-1939, which is the result of this project, mirrors these specific elements. Serhiy V. Bilonozhko, Yuriy S. Komarov, Viktor O. Mysan, Andriy O. Osmolovskyi, Olexandr Zaytstev. Dr. Tetyana V. Ladychenko, Prof. Dr. Olena I. Pometun, Prof. Dr. Yuri Shapoval, Prof. Dr. Olexandr A. Udod, Raisa Yevtushenko. Tony McAleavy, Richard Dargie, Christa Donnermair, Julia V. Kushnereva, Duncan Toms. Lyudmyla M. Mala, Olexandr V. Starukh, Lyudmyla I. Kalinina, Olexandr A. Bilous’ko. Meie Kiel, Kateryna Bardadym, Jos Uyterlinden.